Conference calls every other day. As part of the DailyBuzz Food Tastemaker program, I had the opportunity to try Ghirardelli Intense Dark chocolates. Instead of having chocolates to end my days (and I would presume most do), I thought, why not start the day with them? I start my mornings with my current pound of coffee beans a Costa Rican Chirripo Los Crestones – Finca Alaska that has wonderful dried fruit flavors along the lines of raisin and dried plum. As the coffee cools a tartness appears and a beautiful cranberry note comes into play. The finish on this cup is buttery and chocolatey leaning towards raw cacao nibs. 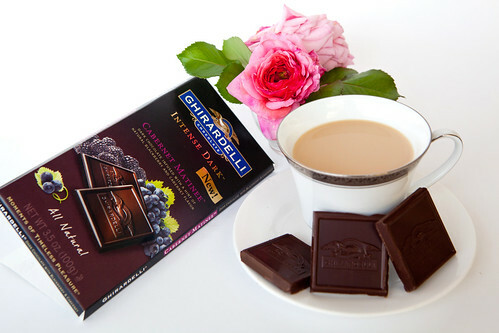 It matched wonderfully with the Ghirardelli Intense Dark Cabernet Matinee chocolate bar’s lush, tart blackberry flavors and velvety bittersweet chocolate. I know it’s sounds crazy for a weekday breakfast but I had to succumb my chocolate craving this morning and whipped up a batch of whole grain pancakes and topped it with a chocolate sauce made of Ghiradelli Intense Dark 86% Midnight Reverie, honey and a touch of heavy cream. It’s not too decadent since the very dark and bitter (in a very good way) chocolate balances the floral sweetness of the honey. To me, this is like having a slice of fluffy chocolate cake for breakfast but healthier, to an extent, and it doesn’t have a lot of sugar. The recipe is below. Mix first 7 ingredients in medium bowl to blend. Whisk buttermilk, eggs, 2 tablespoons melted butter and molasses in large bowl to blend. Add dry ingredients; mix just until blended. Heat griddle or heavy large skillet over medium heat. Brush with butter. Working in batches, drop scant 1/4 cup batter onto griddle for each pancake. Cook until brown, about 3 minutes per side, brushing griddle with more butter as needed. 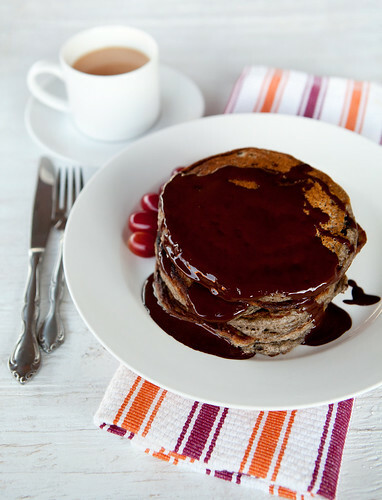 Serve with chocolate sauce (recipe below, or maple syrup, if you choose). Bring cream to a boil in a 1-quart saucepan. Turn off the heat and add the honey, pour hot cream over chocolate in a bowl, gently whisking until smooth. Keep warm or at room temperature. 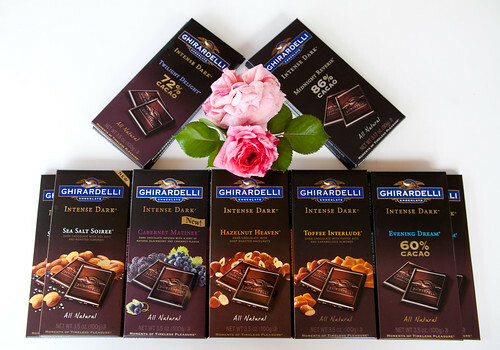 This post is brought to you by Ghirardelli Intense Dark™ by DailyBuzz Food Tastemaker program.